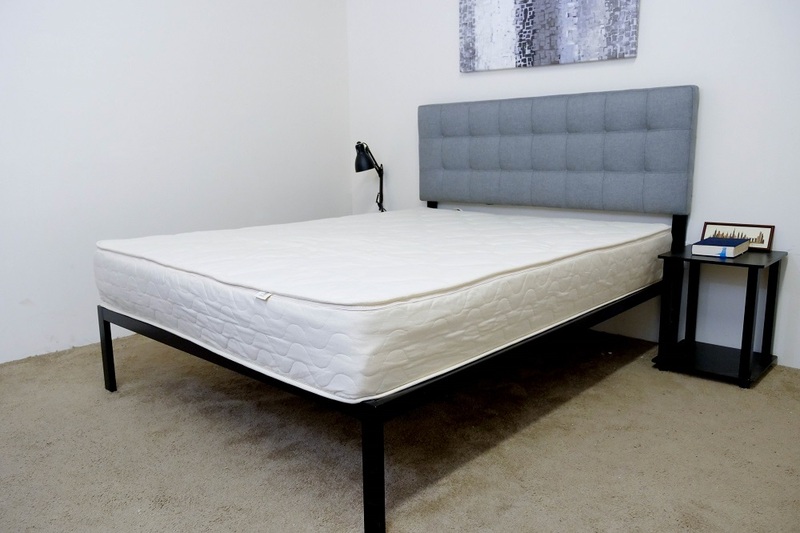 Spindle is dedicated to providing customers with a unique product: a fully adjustable latex mattress! After filling out a quick questionnaire on its website, Spindle will send you a customized parcel of latex layers, which you’ll then assemble at home to your satisfaction. For the purpose of my review, the folks over at Spindle sent me a selection of layers intended to create a medium firm mattress. But before I can take a full dive into this puppy, I’ve got to let it decompress on the frame! As I mentioned up top, after answering a few simple questions (regarding age, weight and sleep preferences), you’ll receive a personalized assemblage of latex layers from Spindle. These sections will arrive in three separate boxes and come in various firmnesses depending on your responses. So, for the medium firm option, I was given two “medium firm” latex layers and a single “firm” one. I’ll dig into how this works more in my full review, but wanted to give you a sneak peek at the Spindle’s different layers. Cover – The cover is crafted out of organic cotton and all-natural wool batting. The combination of materials makes for a gentle hand feel, providing immediate comfort to the sleeper. I should add that wool is great at wicking moisture, which will help keep things nice and cool through the night. Comfort Layer – The comfort layer in this iteration is comprised of a 3” layer of medium natural latex. This material is soft yet quickly responds to pressure, ensuring that the sleeper will enjoy some nice pressure relief without feeling stuck in the mattress. Transition Layer – Directly below the comfort layer, you’ll find another 3” of medium natural latex. In addition to extending the comfort of the top layer deeper into the mattress, this section will also help to transition the sleeper into the bed’s firm foundation. Foundation Layer – The base is made up of 3” of firm natural latex. This section gives the bed its stability and shape, acting as the main support of the mattress. As with the other latex layers, it will also draw on the material’s inherent cooling properties to prevent overheating. Natural Materials – If you’re in the market for an all-natural bed, this could be a great option for you. From the organic cotton and wool batting into the cover all the way through Dunlop latex used throughout, this is a mattress sure to please any eco-friendly sleeper. Sleeps cool – Since this bed is entirely built of latex, I’m guessing that it’s going to sleep pretty cool. The material is well known for its temperature regulation properties, making this a fantastic pick for anyone who tends to overheat in bed.